It has been a while since my last blog but as promised here is a snapshot of my holiday to Bali. I have been back for a week and am missing it already..... holiday blues! Where do i start? We travelled to Bali with Jetstar for our six hour flight. The staff from Jetstar were very accommodating to my needs. They allowed us to board the flight first and then organised storage for my wheelchair. The only negative was that the staff spoke to Aidan rather than directing anything to me although on the way home this was better as the staff spoke to me directly, then Aidan supported me with answering. I was unable to respond using my device as we had already packed it away for safe keeping. We arrived in Bali and headed to our accommodation which was a villa in the town of Sanur. The villa was beautiful although not exactly wheelchair friendly. The staff at the villa were amazing and brought a ramp so that i could get in and out and a shower chair. I had to take my manual chair instead of my motorised. The villa had a pool and some really big sun loungers that i enjoyed laying on. I was able to go in the pool everyday which i absolutely loved. At our Villa we had Aidans Mum, Dad and brother and next door were Aidans Grandparents. I used my device a lot to communicate with everyone. During our stay we enjoyed some awesome activities, we went on a zoo safari and to a monkey park. We went shopping and i chose lots of souvenirs for our house like buddha ornaments and some canvas prints. We went to a water park and enjoyed floating around on the lazy river. We celebrated valantines day in Bali and Aidan gave me a gorgeous bracelet. We went out to many restaurants, on walks, sunbathed and i saw a very beautiful waterfall. Although it was great getting out and about Bali isn't the most wheelchair friendly place as a lot of the pavements are really broken so it was quite a bumpy ride! During one walk we got caught in extremely heavy rain, so my device got super wet!! To my horror it actually stopped working, i was panicking big time. Luckily once it dried out it started working again thank goodness. I used my device most days to check in on my Mum and see what she was doing as she was in Europe, so it was great to see all her pictures and stay in touch. I also enjoyed sending friends my holiday snaps. I was able to check my emails using my device while i was away. My communication with the local people was really limited and i think that was more down to there being a language barrier rather than anything to do with my disability so i didnt really use my device much when interacting with the locals. I did however use my device to have converstaions within our group all the time. Bali was a beautiful place to holiday and i would definately consider going back! I am already googling where our next holiday will be. New Liberator Accent devices include a full version of Timocco We are excited to announce that every new Liberator Accent device includes a full version of Timocco-on-Accent. A Whole New World: My experience of changing communication devices "OMG you have a new communication device! You are so lucky! Isn’t it awesome”. I think everyone says that when they see you with a new communication device. Max Max is 17 years of age and has a diagnosis of ASD. He currently uses an Accent 1000 with LAMP Words for Life. The day I say "I do" Jess, a 21 year old Accent 1000 communicator, lovingly shares with us parts of her story. 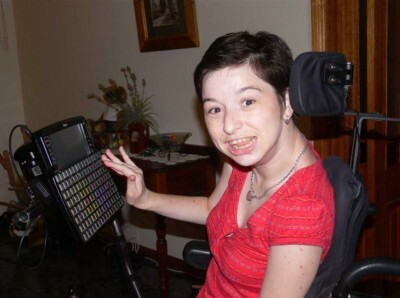 This complete post was written by Jess on her communication device and truly highlights how powerful AAC can be in connecting and empowering us.